What’s up, folks! This is Brent here. 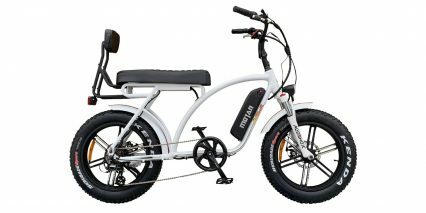 I’ve been focusing on electric bikes from AddMotoR for the last couple of reviews and this one is called the MOTAN M150-P7 folding electric bike. 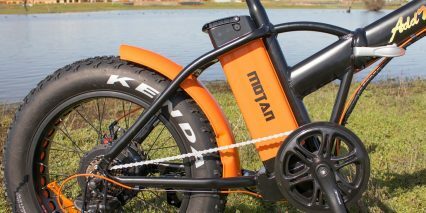 Just like with the MOTAN M-5800 I reviewed before it, this one came in black with orange accents and I have to say, the color scheme appeals to me because it’s bright and fun. It feels like AddMotoR spent some time figuring out where to put the color accents and how much to splash in there to really make it pop. I dig the orange battery and rims, and especially the orange wiring. 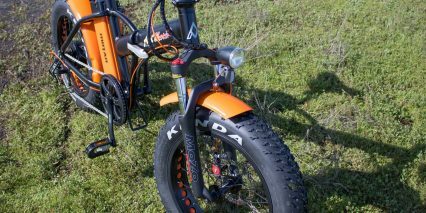 Really pulls everything together to make for a head turner of an electric bike. 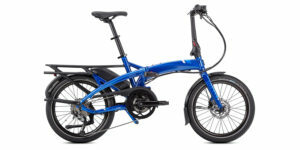 The M150-P7 feels like a practical folding bike that has a few features enabling it to tackle some terrain other folding electric bikes might not be able to. 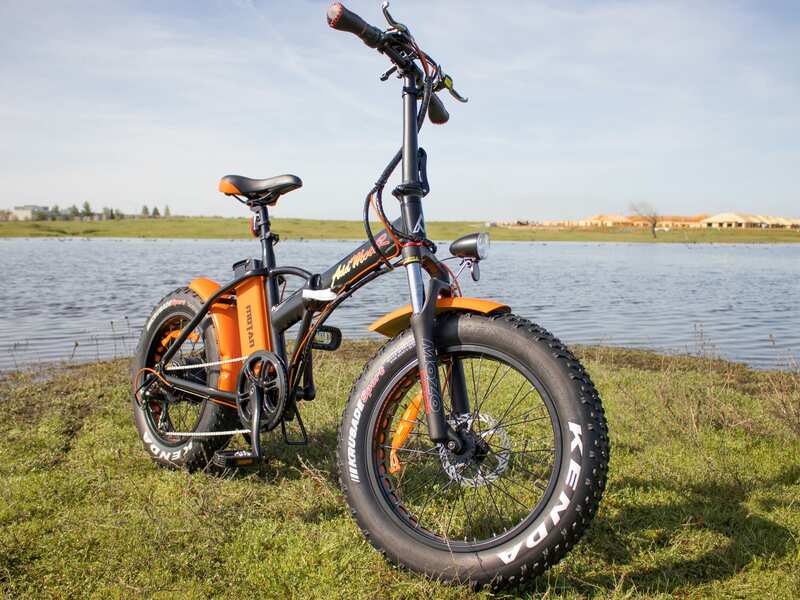 Specifically, this electric bike has 4” wide fat tires, a relatively large 11.5 amp hour battery, a 750 watt hub motor with a top speed of 20 mph. 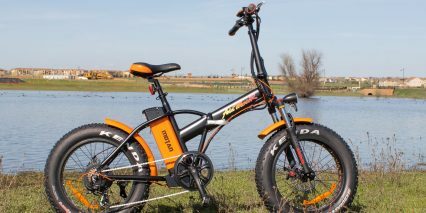 It can be operated via throttle or with pedal assist. 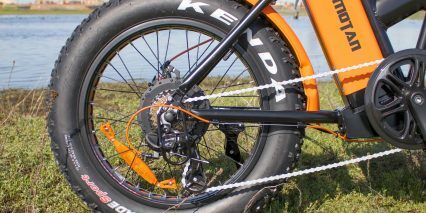 It also has MOZO suspension fork with great 100 mm of travel, lockout, and preload adjust. 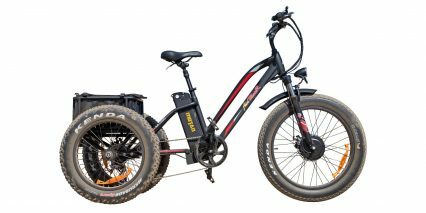 Combined, this folding electric bike, like the M-5800, does pretty well on soggy terrain, particularly mud, snow, sand and gravel. 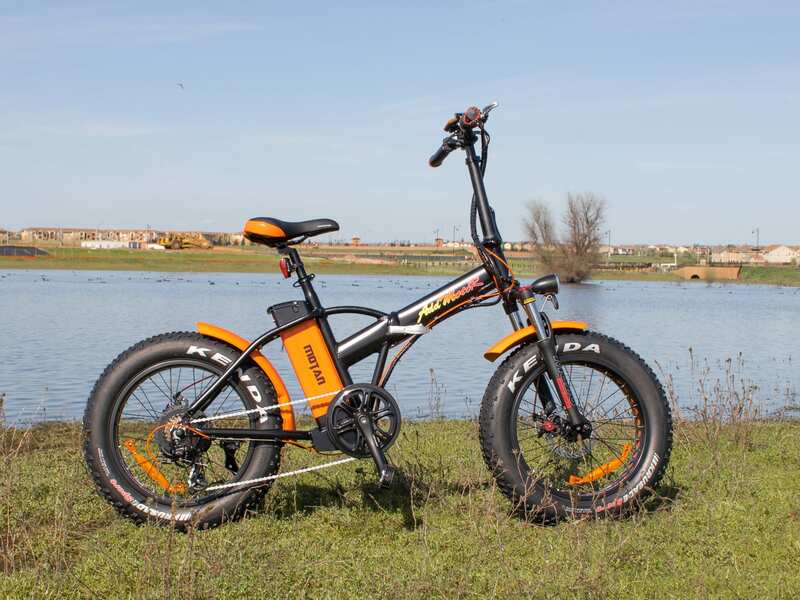 On the AddMotoR website it states this bike tops out at 25 mph, which would classify it as a class 3 electric bike, potentially decreasing the amount of places it could be legally ridden. However, the bike that I tested toped out at 20 mph, so I’m guessing there’s probably a way to adjust the top speed in the settings of the control center. 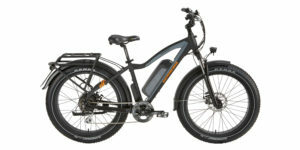 As with all bikes from AddMotoR, this is a direct order electric bike. This company doesn’t have any physical brick-and-mortar shops that I’m aware of, which poses some great upsides, but also a few drawbacks. One huge pro with this setup is the price. 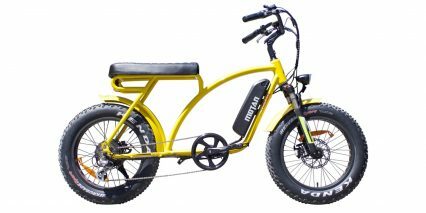 Generally speaking, electric bike companies that are direct order are able to offer their products at a more affordable price than if they were sold in a shop. This one, for instance, runs for $1,599 — a price that feels pretty affordable given what comes with. However, there’s also some downsides to direct order only. For starters, the bikes have to be assembled by the buyer. This isn’t a huge deal in my opinion, and while it used to take me about an hour to put everything together, I can now get everything up and running in about 30 minutes because I have the correct tools ready. However, this also means that the bikes don’t come pro-tuned from a shop. So some adjustments might need to be made to get everything running perfectly smoothly, specifically with the disc brakes, which could have some rub and rattle. Again, not a huge deal, but I want to point out all the little things I can think of. One of the biggest drawbacks though to direct order is that what you get is what you get. 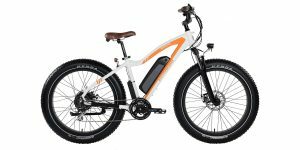 While I haven’t seen this with AddMotoR, I have on more than occasion received a bike with different components than what was listed on the website. Also, and this is something I have experienced with AddMotoR, all the pieces may not fit perfectly. With this bike, the front fender wouldn’t fit, so I had to grab some pliers to bend a few pieces into place before I could attach it. Lastly, there can be a bit of a language barrier, especially when trying to get specific details on the specs. Personally, I think the savings in price is worth some of these small potential hiccups, but of course the ultimate decision is up to you guys. 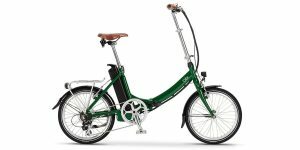 My hope is that this review, with the carefully listed specs above, empowers you beyond what AddMotoR communicates so you can make an informed decision and compare against other models. So, let’s dive in! 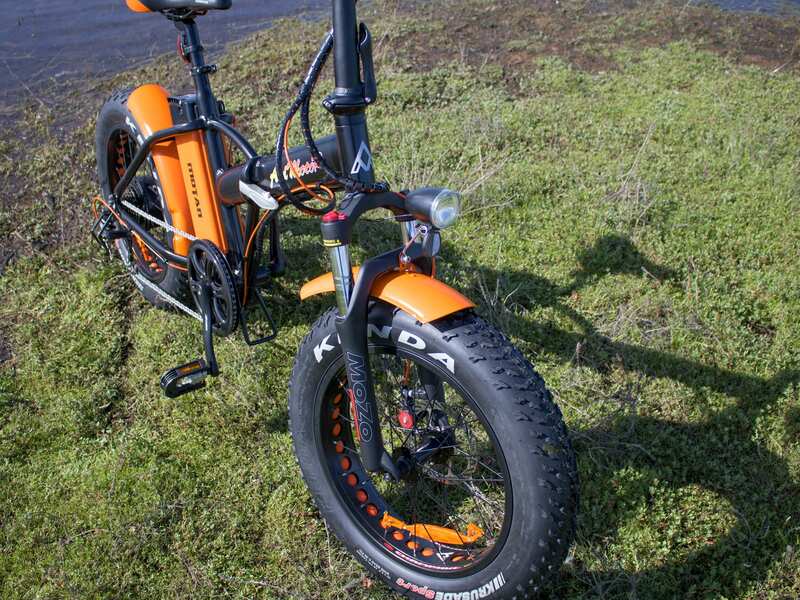 Driving this bike is a 750 watt planetary geared hub motor with 80 newton meters of torque. I’m not exactly sure what brand this motor is, but it looks like Bafang. It’s pretty peppy and was able to get me up to the top speed of 20 mph, using the throttle only, with ease. I weigh 200 pounds, for reference. 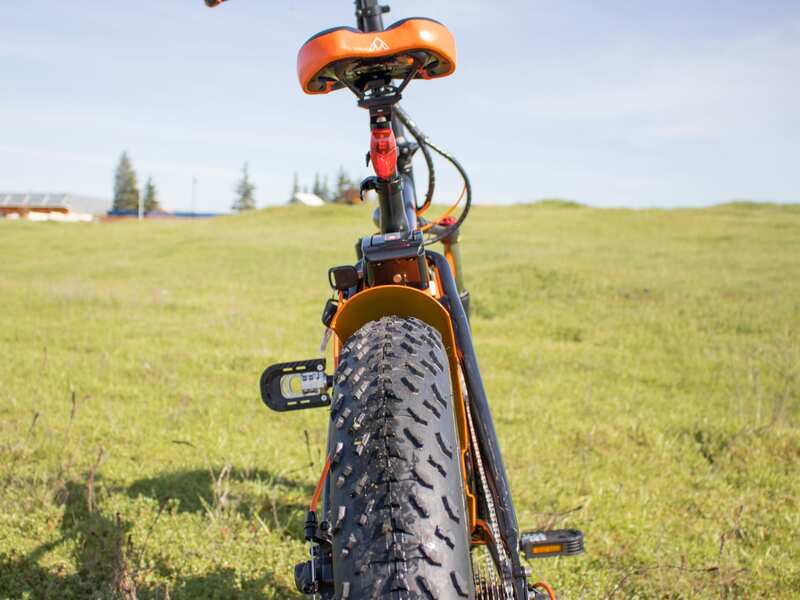 Like most bikes from AddMotoR, there’s a few different tiers of each model. 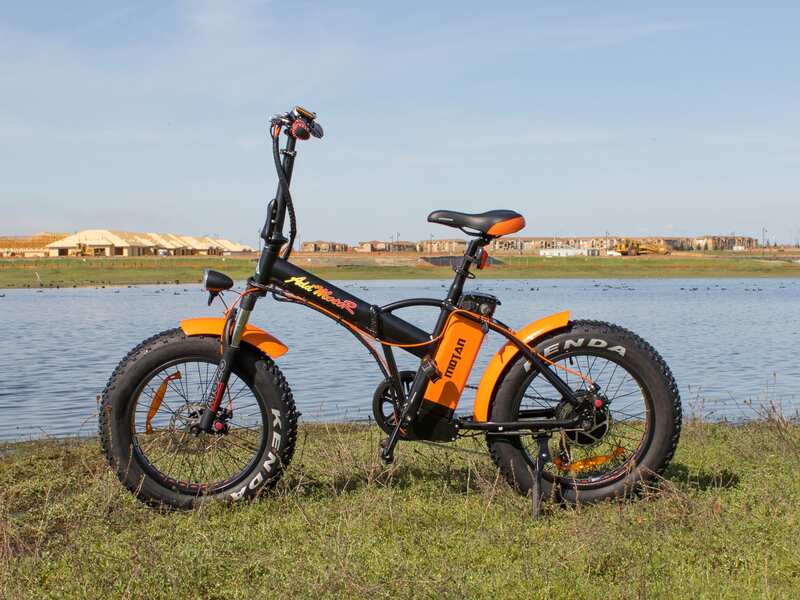 For instance, the M150-P7 has suspension and a 750 watt hub motor, and costs $1,599. 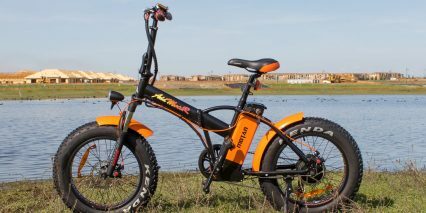 But the M150 has no suspension, a 500 watt hub motor and a slightly smaller battery for $1,299. 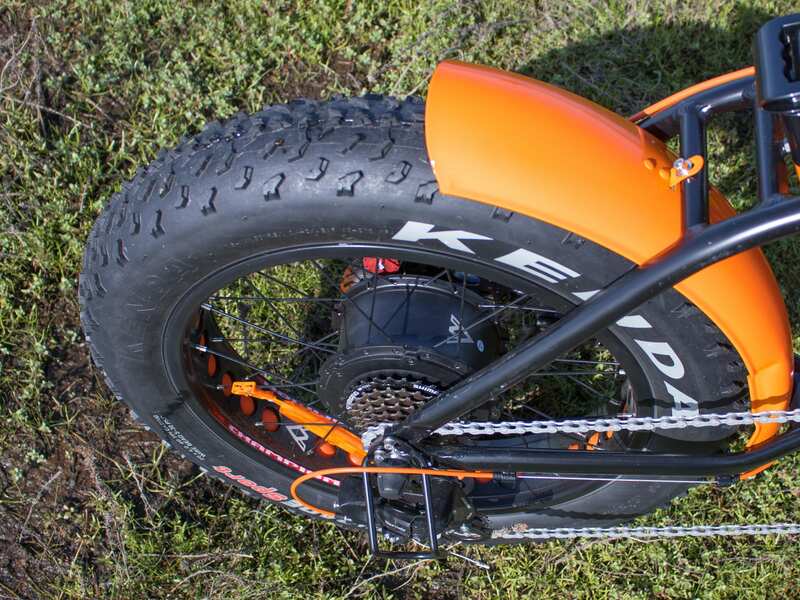 It’s cool there are different tiers to choose from, but since this bike has the extra wide 4” fat tires and weighs in at a pretty heft 60.7 pounds, I’d opt for P7 version if only for the 750 watt hub motor and bigger battery. 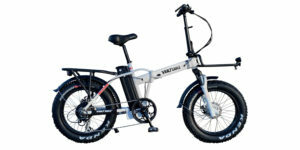 At 60.7 pounds, this is definitely heavier than a lot of other folding electric bikes, and because the battery is located behind the seat tube, and because the motor is located in the rear wheel, it is quite back heavy. 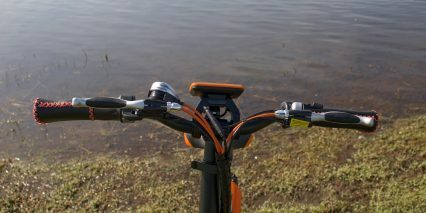 Thankfully, AddMotoR includes a sort of handle that’s built into the middle of the frame and works well as a way to pick up and carry the bike. 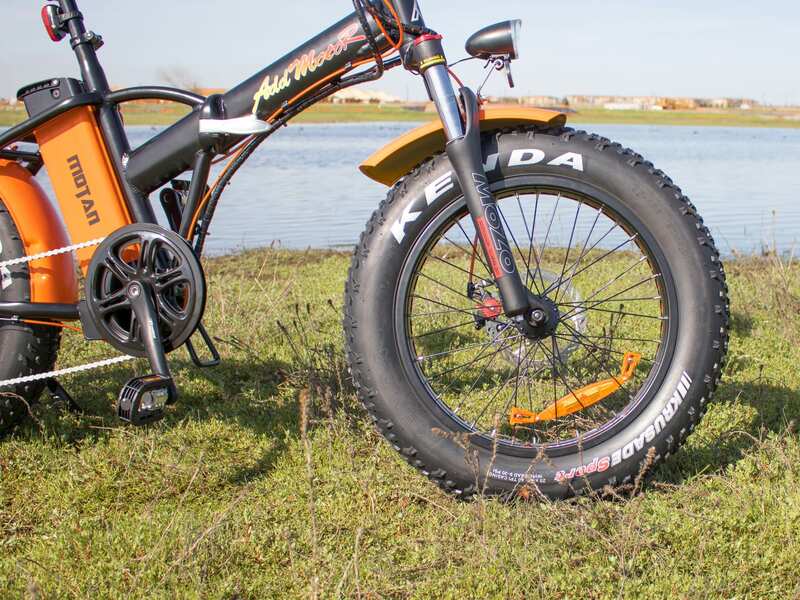 The extra wide tires are great for tackling soft terrain because of the extra surface area, and they offer additional suspension because of their increased air volume (granted these are only 20” x 4” tires compared to the M-5800’s 26” x 4” tires). 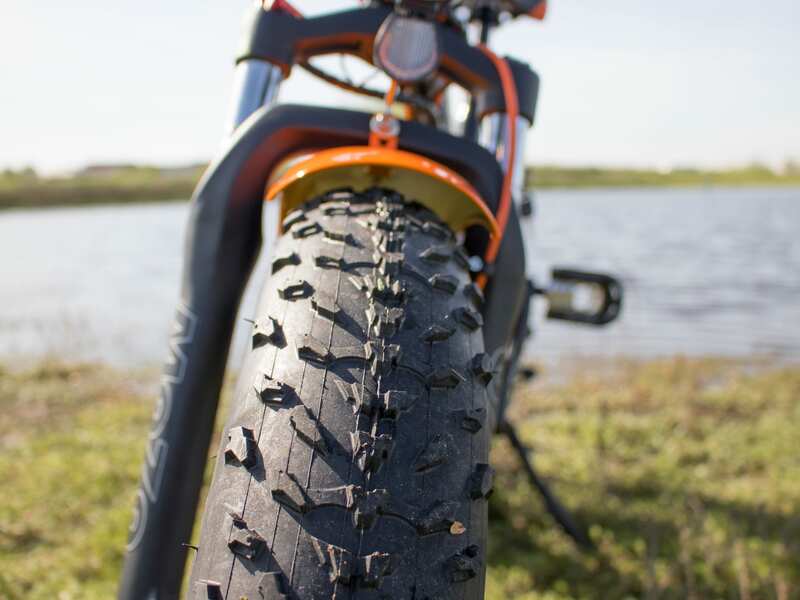 It’s worth noting that the bigger tires do present one big drawback, increased rolling resistance and noise. 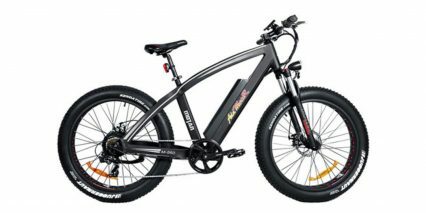 That additional weight and drag of the wheels is going to require more effort to get the bike going, so the 750 watt motor is a great choice. 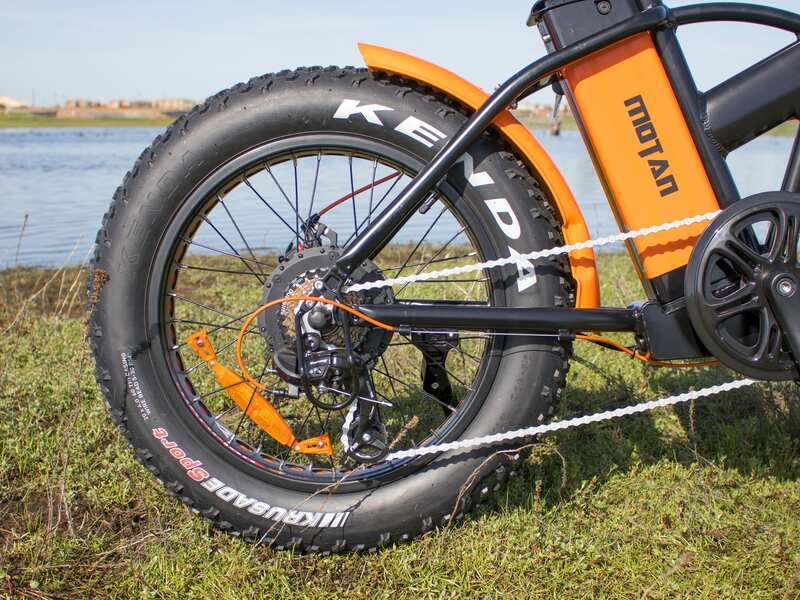 The tires also have punched out rims which does save a bit of weight, but because they are only 20” tall, they have a lower attack angle compared to taller tires. 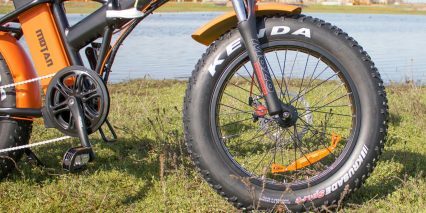 Last thing about the tires I want to mention is that they are 5 to 30 PSI, which I think is great for utilizing them for that muddy, snowy, sandy and just generally slushy terrain (with the 5 to 8 PSI) or efficient hardpacked or pavement terrain (with 25 to 30 PSI). 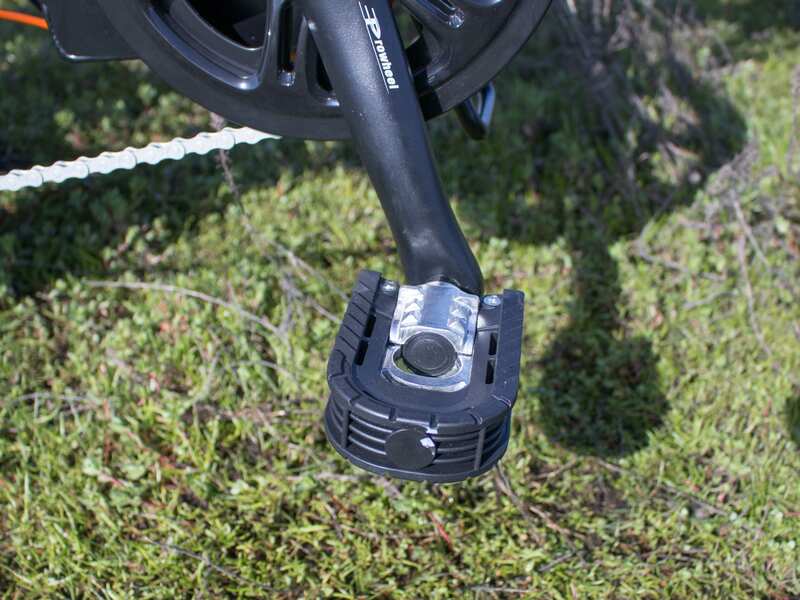 Just like airing down tires on a 4×4 when off-roading, these tires can be aired down to provide even more traction and surface area, but that will of course increase the drag even further. 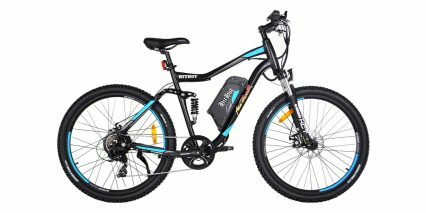 Powering the M150-P7, the backlit LCD display, and headlamp is a 48 volt, 11.5 amp hour battery pack, offering 552 watt hours of total capacity. 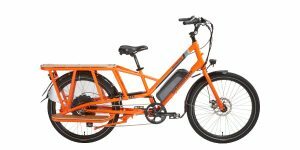 This isn’t as big as the monster 840 watt hour battery on the M-5800, but still a bit larger than average for a folder, which is nice given that extra rolling resistance from the tires and heavy 60.7 pound weight. You can really drain the battery down by using throttle only, or riding in the highest level of assist through soft terrain. The battery here weighs about 7.8 pounds but has a nice carrying handle at the top so it doesn’t feel so bad lugging it around. The battery pack is located at the rear of the seat post which, again, does make the bike feel back heavy. 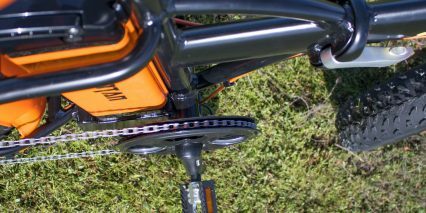 The battery pack is locking and removable, which is great for charging it on or off the bike. 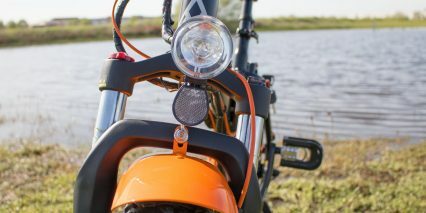 The keys are used to lock the battery to the bike as well as turn it on. 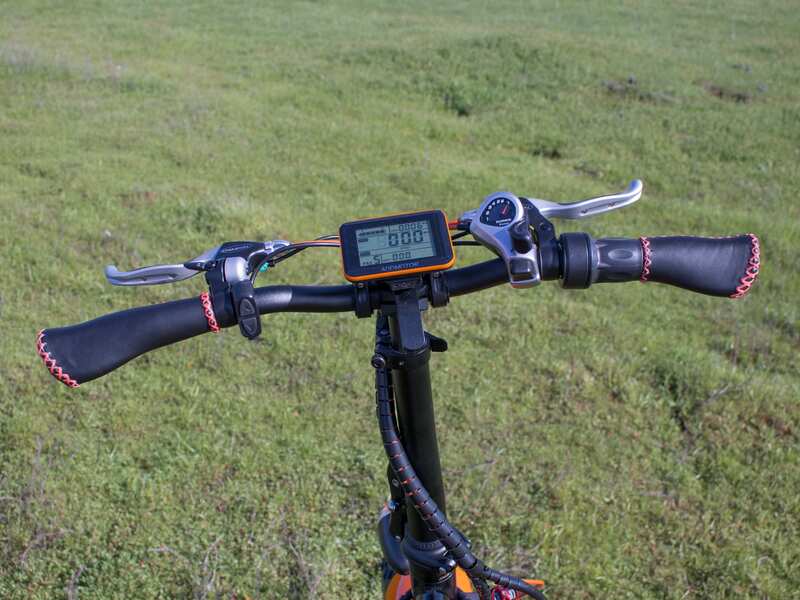 Only after turning the battery on can you press the power button on the control pad up at the handlebar to get the bike moving, which adds some time and might require you to get off the bike or twist and stretch down. The rear of the saddle extends over the top of the battery and must be removed before the battery will slide out. Thankfully, the seat post has a quick release collar, but it’s still an extra step to remove the battery. 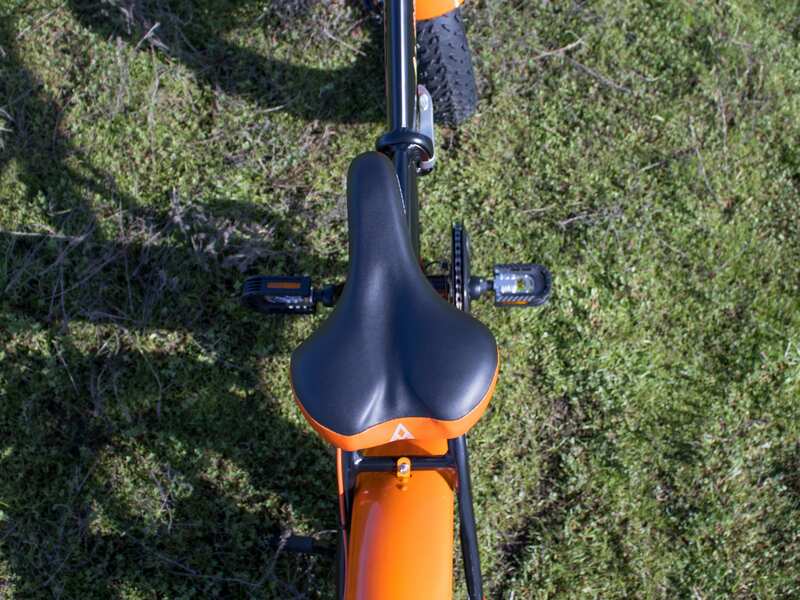 The good news is that the battery doesn’t get in the way of the seat being dropped all the way down, which is great for those who have a shorter inseam. I do have to point out again how much I dig the orange here. 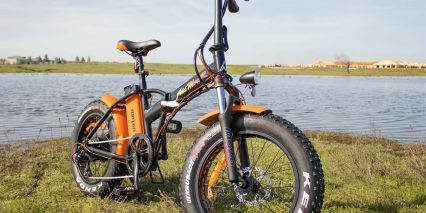 The battery pack is bright orange and really makes the bike stand out. 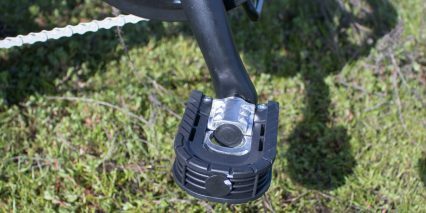 The three-prong charging port for the battery is located at the top and easily clears the cranks and pedals, so there’s virtually no chance of the power cord getting snagged while it’s plugged in. 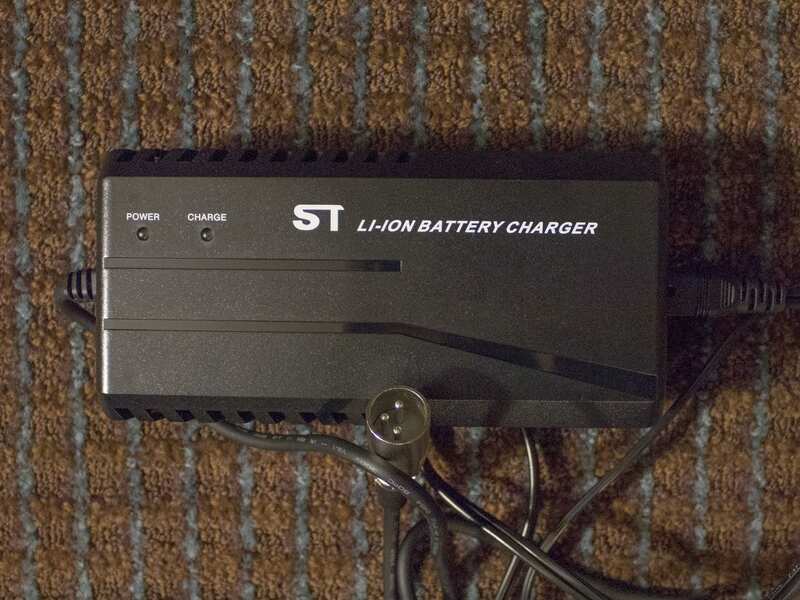 The charger for this bike has an output of 2.5 amps, which is just a tad bit higher than the average 2 amp battery chargers. 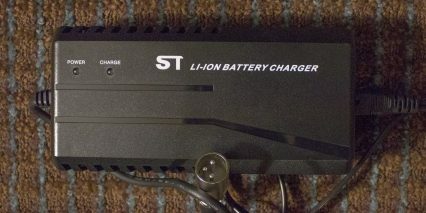 I’m not sure exactly how long it takes to charge this battery up from empty, but I’d guess somewhere around four hours. It’s best to store the battery in a cool, dry location, and avoid letting it drain to 20% in order to reduce stress on the cells. Check it every month or two if you haven’t been out for a ride. 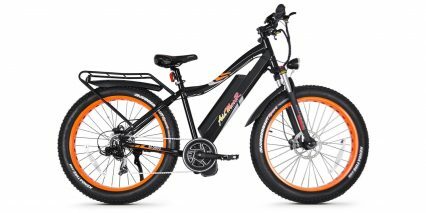 Turning the bike on is a two-step process that starts with inserting the key into the battery pack and giving it a turn, then long pressing the power button on the Independent button pad, mounted to the left side of the handlebars. Since the key must be left in the battery pack for it to be active, there’s some potential for snags or rattling if you have a keychain attached. 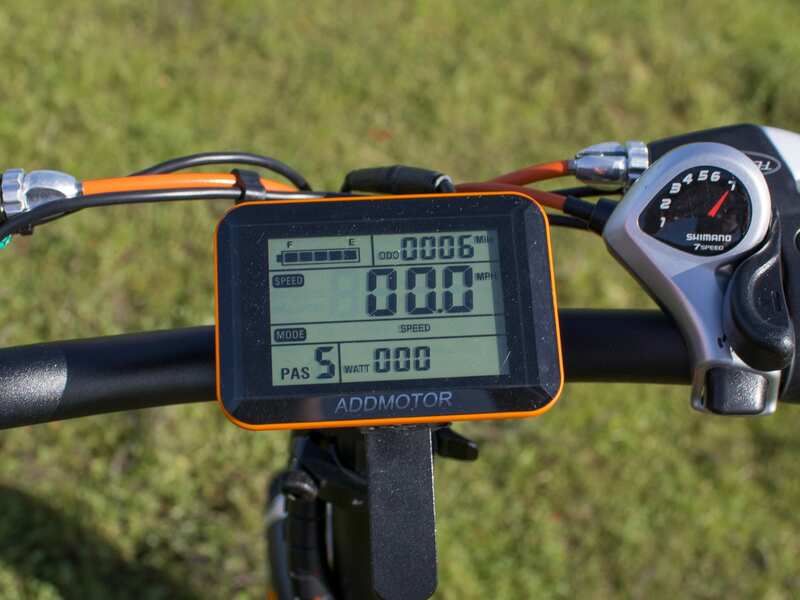 The display is an AddMotoR branded backlit LCD that offers a fair amount of information at a glance, including current speed, max or average speed, tripometer, odometer, assist level (0-5), battery level (5 bar) and wattage output. 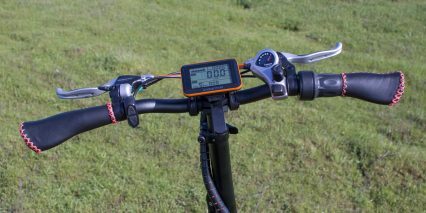 Tapping the power button cycles between seeing the tripometer and odometer, holding the down arrow activates walk mode, holding the up arrow cycles through average speed and max speed and holding the up arrow and the power button simultaneously activates and deactivates the backlight and headlight. This is a pretty large display and it isn’t adjustable without a tool, which means tilting to reduce glare isn’t an option, and it might also get scratched up at the bike rack or when you fold the bike. 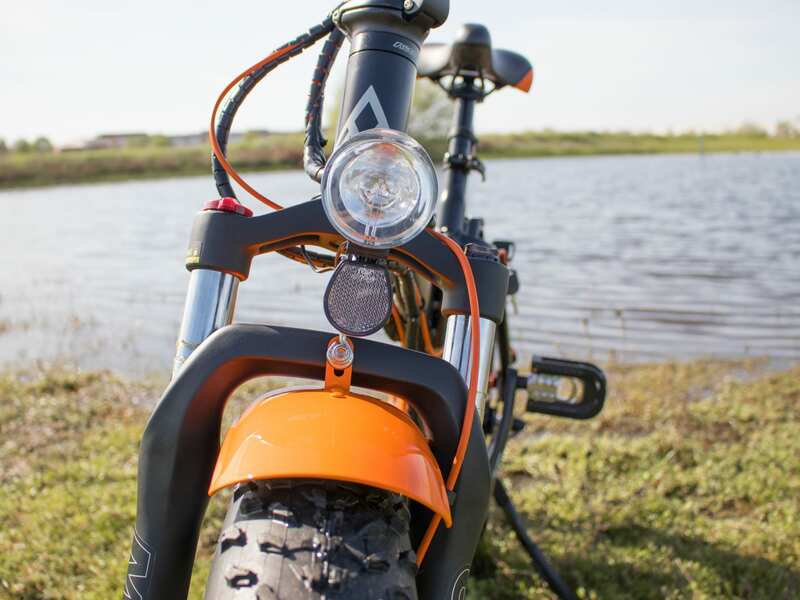 The headlight on the M150-P7 is located on the arch of the suspension, so it isn’t sprung and will bounce around more than if it were placed on the frame itself. That being said, the beam pattern here isn’t too bad. It’s focused enough and bright enough to provide some real illumination for riding at night. There is a tail light, but it’s independent from the electronics and battery, and it requires three AAA batteries to operate. Just remember to turn it on and off, and maybe keep some spare batteries around so you can be safe when riding at night. 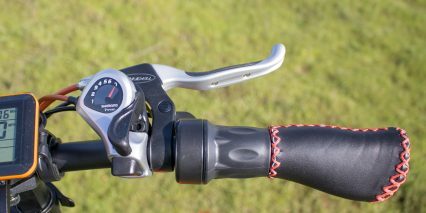 Depressing the brake levers activates the motor inhibitors, ensuring the shortest possible stopping distance. And, that’s a really good thing since you’ve got a lot of power on hand. 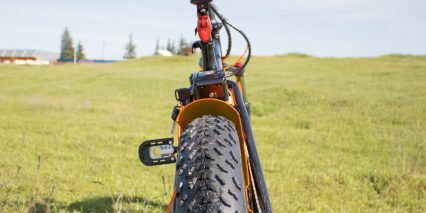 The pedal assist activates via cadence sensor vs. a fancier torque or multi-sensor, so motor inhibitors are more important here and on other more basic ebikes than some of the fancier higher-end ones. 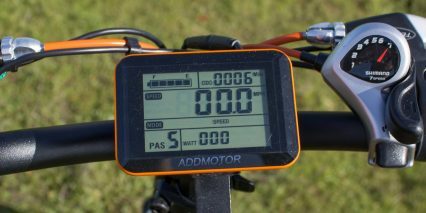 With the 12-magnet cadence sensor, there’s a bit of start and stop delay with the motor when I start and stop pedaling. 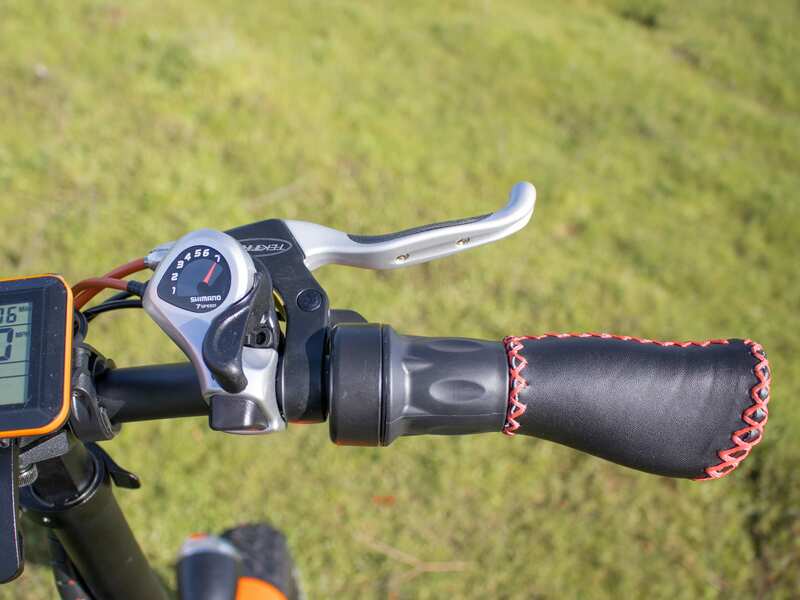 The brake levers aren’t adjustable, however, so those with extra small or extra large hands, or those that wear gloves while riding may find grasping the levers less comfortable than hydraulic levers. 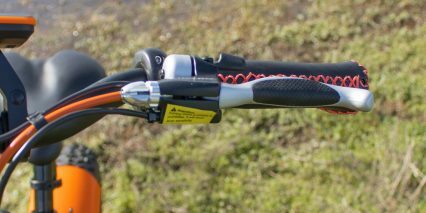 And since these are mechanical brakes, they will require a bit more grasping force compared to hydraulic brakes and the cables will stretch over time. 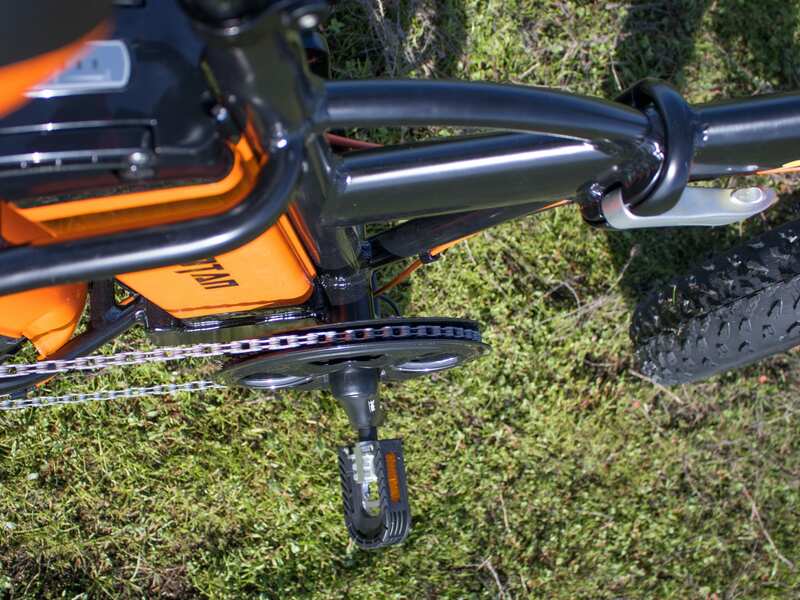 Like the M-5800, this bike offers pedal assist levels 0-5. At 0, the pedal assist and throttle are not active. At 1-5 they are live (the throttle is live from 0 mph in assist settings 1-5 and offers full power). I prefer this configuration as it allows me to have instant power from a standstill, but I do want to caution against accidental activation when walking the bike while it’s powered on. 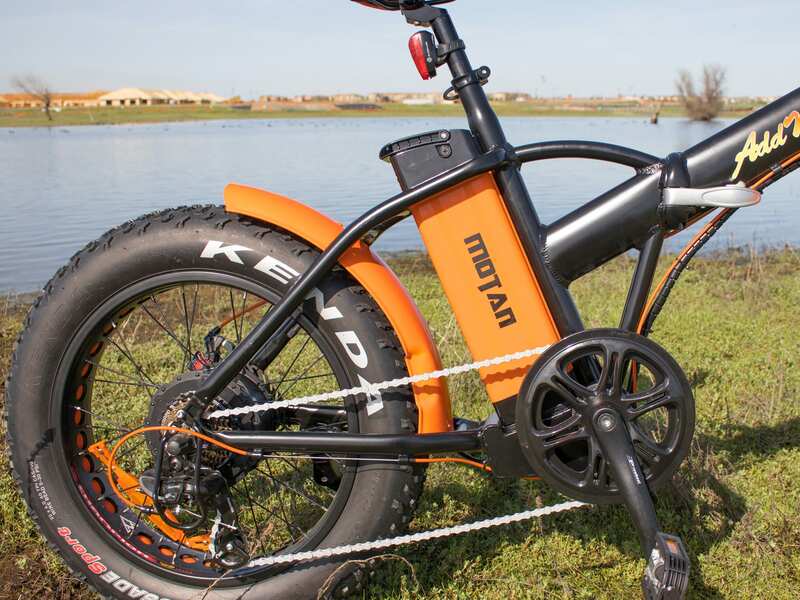 What’s cool about this bike compared to the M-5800 is that the throttle can unleash all 750 watts of power from pedal assist levels 1-5 vs. being limited. I used this multiple times when crossing cross walks, but could see how the twist-throttle could get bumped when mounting/dismounting or be twisted too hard if you got started while riding, and send the bike out of control. Twist throttles are satisfying, but more prone to accidental activation than smaller trigger throttles… and this one is at full power whenever assist is live. 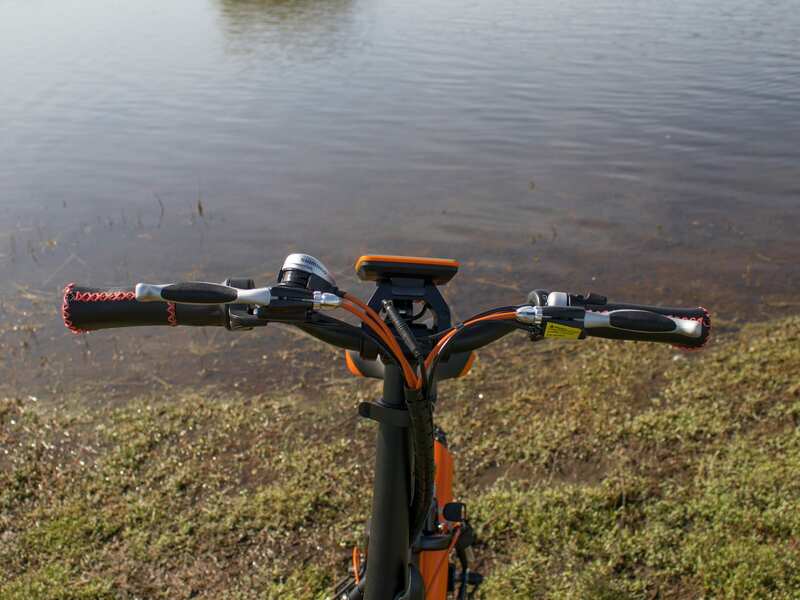 This was another fun e-bike to review from AddMotoR and I think the M150-P7 is a good choice for those who need a portable folding electric bike that can still be taken off-road and through some soggy terrain. 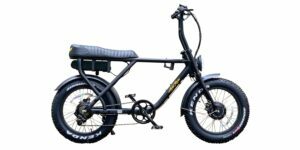 Of course, at this point there’s quite a few other electric bike companies that offer fat tire folding bikes and some of them have great customer service and physical shops so you can check out the bikes before buying them (and have someone else put them together for you). Because this bike is shorter than a full size bike, and because the handlebars are a bit shorter as well, it doesn’t feel quite as stable. In fact, I used this bike to grab a coffee from a local coffee shop and while I was carrying the coffee back in one hand and trying to steer with the other, this point became painfully obvious. I really like the style of this bike and appreciate the folding process. Folding and unfolding the M150-P7 is pretty painless and requires two latches to be undone. One latch is located on the middle of the frame, allowing it be folded in half. The other latch is located at the base of the stem and allows the stem to be folded downwards towards the frame. 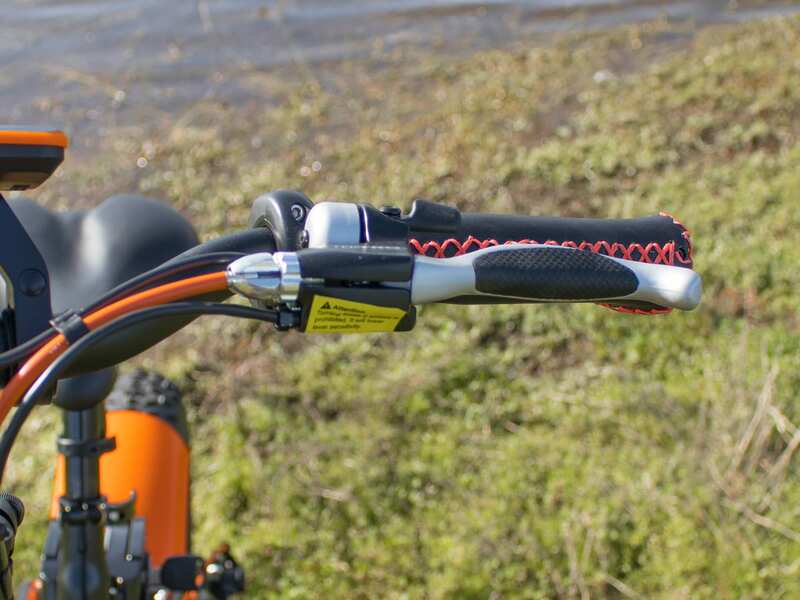 To help the bike fit into even tighter spaces, there’s one last latch just above the headset which allows the handlebars to be turned to save a little more room. And lastly, the pedals themselves fold. These folding pedals don’t feel as high of quality as some of the Wellgo folding pedals I have seen, but they still function fine enough. 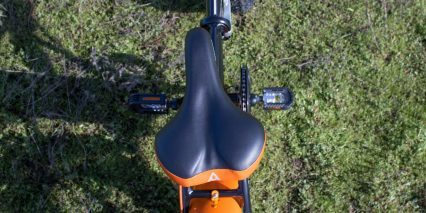 The mid-frame folding joint bulges out a bit, so be careful not to bump your knees when pedaling or standing over the frame. At the bottom of the frame is a bracket that serves to rest the bike on when it’s folded. And great news! 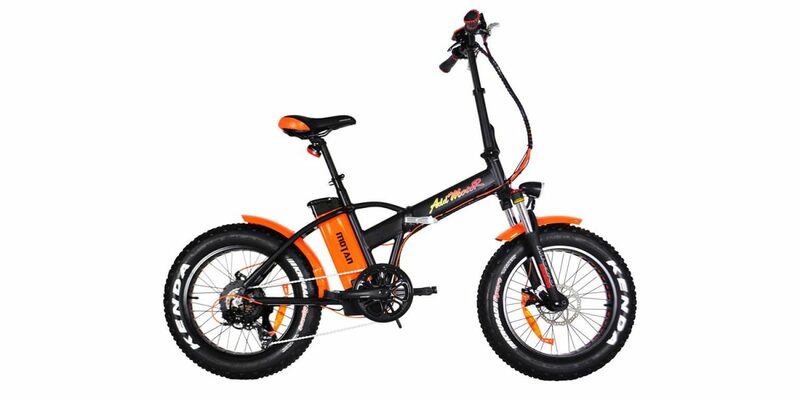 The M150-P7 can actually stand upright on its own without falling over. 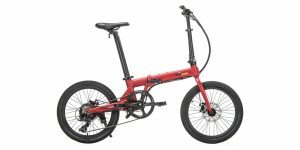 Some of the other folding bikes I’ve tested couldn’t do this, so I just wanted to point that out. 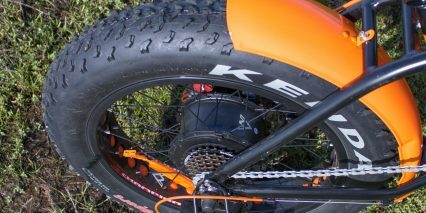 I dig the orange steel fenders as well, but again, they were a little difficult to install, and this bike doesn’t have rack bosses or bottle cage bosses. 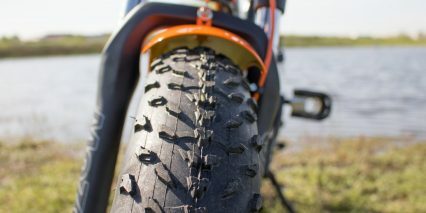 The good thing about these fenders though is they are quite rigid and didn’t rattle at all while riding. Just watch out for rusting if they get scratched and expose the metal underneath the paint. I’ll try my best to answer any questions you leave in the comments below and in the AddMotoR Forums, and I want to thank AddMotoR for partnering with me on this review! What other bikes should compare. Folding fat tire 750w front suspension back rack. Any dealers in Denver? same look too.